Little Bean Workshop: Where Have I Been...Attempting to Quilt! Where Have I Been...Attempting to Quilt! Now how could I not fall in love, I ask you. So, many, many months ago, I decided to start making this quilt in all purples and white for Little Bean. This is for her twin size big girl bed and the plan was to have it done by the time she was in it. I have failed. 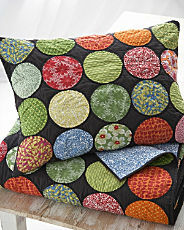 I thought that the cutting of the circles and the piecing of the quilt was time consuming. I finished all that last week. Now I am doing the actual quilting. Ugh...it is sooo tedious. I am doing it on my little Brother sewing machine which doesn't help matters, but to pay someone else to do it or to take a course on the long arm quilting machine at the local quilt shop would cost me over $100...and for that price, it's hardly worth making it myself, am I right? So, I will be posting about the quilt once it is all done. Although buying one from Pottery Barn Kids sounds like a much better suggestion at the moment. I fell in love with the same garnet hill quilt. But I just want someone to buy me one. I wish you luck, and I look forward to seeing it when you finish. ps haha, I just read your profile ...I love polka dots too! My name is Amy. I love black. I love white. I love coffee. I love organization. I love polka dots. I love being a mom. I love my husband. I love decorating (cakes, homes, you name it). I love to sew. I love to paint. I love damask prints. I love my family. I love sleep. I love food. I love wine. I love baking. I love holidays. I love reading. I love the sun. I love ... (literally using the dot, dot, dot).